Car accidents and truck accidents can lead to a herniated disc or other disc injury, as well as nerve damage. 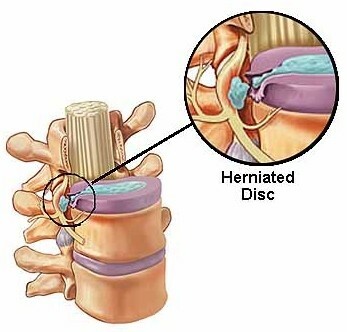 Disc injuries refer to a variety of medical conditions. Some of the more popular diagnosed conditions include herniated disc, bulging disc, ruptured disc, torn disc, nerve root avulsion, traumatically induced spinal cysts and slipped disc. A serious disc injury can cause immense pain too or even debilitate an accident victim. Car accidents and truck accidents can lead to a herniated disc or other disc injury, as well as nerve damage. The disc injury and nerve injury can be related, such as when a slipped or herniated disc causes a pinched nerve, nerve impingement, radiculopathy, or chronic pain. At The Hoffmann Law Firm, L.L.C., attorney Chris Hoffmann has over 15 years of experience handling car accident claims, including those involving herniated disc injury and pinched nerve damage. His aggressive approach to handling claims and willingness to go trial are known to many insurance companies, and we believe this leads to much better initial settlement offers from those companies. To discuss your herniated disc or pinched nerve injury claim from a car or truck accident contact The Hoffmann Law Firm, L.L.C. today at (314) 361-4242.